02.02.2018 - At the initiative of Georgia, issues related to Russia’s illegal actions in Georgia’s occupied Abkhazia and Tskhinvali regions were discussed by the Committee of Ministers Deputies of the Council of Europe at its 1305th session on 31 January and by the OSCE Permanent Council at its 1174th session on 1 February. The Georgian side provided the participants of both meetings with detailed information on the Russian Duma’s ratification of the agreement on the integration of the occupied Tskhinvali region’s illegal military groupings with the Russian army, as well as on the opening of the so-called customs checkpoint in Akhalgori by the Russian occupation regime, and the setting up of a special customs post in Sokumi by the Russian Federal Customs Service (FTS). Condemning Russia’s actions, the Georgian side assessed them as steps towards annexation of the Georgian territories. It was underlined that this policy of the Russian Federation contradicts the norms of international law and the Ceasefire Agreement of 12 August 2008, obstructs the process of peaceful resolution of the conflict and excludes the possibility of achieving the progress in the Geneva International Discussions. Statements in support for Georgia were made within both organizations. According to representatives of the delegations of the EU, Ukraine, Poland, Estonia, the United Kingdom, Lithuania, France, Finland, Latvia, Germany, the Czech Republic and Moldova to the Committee of Ministers Deputies of the Council of Europe, the Russian Federation’s actions amount to an attempt of actual annexation of the Georgian territories and call for immediate and strict action by the international community. They condemned the ratification of the agreement on the integration of the occupied Tskhinvali region’s illegal military groupings with the Russian army, as well as the opening of the so-called customs checkpoint in Akhalgori by the Russian occupation regime, and the setting up of a special customs post in Sokumi by the Russian Federal Customs Service. Calling on the Russian Federation to comply with its international commitments, including the Ceasefire Agreement of 12 August 2008, the Ambassadors reaffirmed their unequivocal support for Georgia’s sovereignty and territorial integrity. At the session of the OSCE Permanent Council, statements in support for Georgia were made by the delegations of the EU, U.S. Canada and Ukraine. Macedonia, Montenegro, Albania, Bosnia and Herzegovina, San Marino, Ukraine and Moldova aligned themselves with the statement made on behalf of the EU. Iceland and Norway joined the Canadian delegation’s statement. 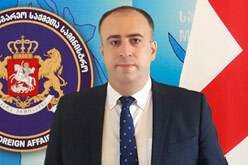 They unanimously expressed their support for Georgia’s sovereignty and territorial integrity within its internationally recognized borders, condemned Russia’s illegal activities in the occupied territories of Georgia and stated that they do not recognize the agreement on the integration of the occupied Tskhinvali region’s illegal military groupings with the Russian army ratified by Russia. The Canadian and U.S. representatives called on Russia as a party to the Geneva International Discussions to revoke the agreement. They also urged Russia to comply with its commitments under the Ceasefire Agreement of 12 August 2008. According to the delegations of the EU, Iceland, Norway and Canada, Russia’s action are aimed to undermine the efforts to peacefully resolve the conflicts. They also highlighted the importance of restoring the full-scale OSCE Mission in Georgia. According to the Ukrainian delegation, Russia’s actions represent the violation of Georgia’s sovereignty and the continuation of the policy aimed at the destabilizing the Black Sea region and undermining the security architecture of Europe. Ukraine called on Russia to withdraw its armed forces and occupations administrations from the occupied territories of Georgia and Ukraine.